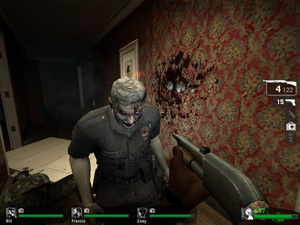 As you may know, Valve’s latest game, Left 4 Dead is the an intense run-away-from-zombies cooperative game that brings a breath of fresh air to gamers that have been craving a decent PC-Coop game since Doom 2. In that sense, it’s a great game… but because it’s a cooperative game, it’s unlikely that it will replacing any of the major shooters. *UPDATE 2* Make sure you download the new Hunter Training map from the Training Section ! So if you’re more of a purist, and want to play this as a single player game, with the best graphics on and the most immersion, then you might want to skip this article. If however, you’re ready to tweak the game, learn the little tricks and rip everything to shreds, then read on. 3. Type: “openserverbrowser” in the console. With hundreds of zombies flying your way, you’re likely to need to do some quick firing. If you’re going to be doing “twitch shots”, then it’s better to make your mouse as responsive as possible and reduce all the mouse acceleration that you can. 3. Find the “Wait For Vertical Sync” option and set it to DISABLED. 5. Set the “Mouse Filter” option to ENABLED. But wait, we’re not done! To reduce mouse acceleration even further (which will make it easier to aim! ), you must add a few commands to the launch options in Steam. in your Left 4 Dead launch options. If you’re wondering how to do this, I made a quick video for you. The default settings that Valve picked for my system made everything look great, but I was averaging 50-60fps instead of my usual 120+. Not happy with that, I ran through the entire list of possible variables in Left 4 Dead to find ways to tweak the appearance. Shockingly, I found that nearly EVERYTHING is cheat protected! That means that custom configs are SEVERELY limited and therefore, you won’t be seeing many “MAX FPS CONFIGS”. However, simply going to the video options and putting EVERYTHING on “Low” gave me a tremendous boost in speed. Remember to disable Anti-Aliasing as well. Surprisingly, the game still looks great even when everything is on low settings. It just runs better, provides smoother mouse movement, and makes it much it a much more enjoyable experience. I did find ONE secret variable that allows you to see everything better. Start by going in the video settings and putting your brightness to the max. For even MORE brightness. If properly set up, you’ll be able to see in even the darkest areas without a flashlight. Unlike most first person shooters, Left 4 Dead does NOT require huge network requirements to run fast. This is probably because the computer controlled monsters are rushing you instead of real human players. Even if your teammates lag around a little, it won’t make such a huge impact. In fact, playing around with the interp (usually critical in FPS games) seemed to have a more negative impact. First, if you’re inexperienced, take the machine gun. If you have semi-decent aim, take the shotgun. The shotgun is much more effective at killing hordes of enemies as long as you take your time to aim. Every shot counts, so instead of shooting quickly, make sure you are accurate. In Left 4 Dead, it’s strongly discouraged to rush out alone… and even though I enjoy doing anyways, if you want to stay alive on expert, it’s strongly recommended that you stay near your team. Because most zombies simply rush towards you, it’s usually recommended to simply walk backwards towards your team when you’re being rushed. As a team, the ONE thing you want to concentrate on is always making sure that your back is covered. If you can get into a corner or even a tight corridor, that’s a good thing. That way, they won’t be able to sneak up behind you. Seems obvious, but that’s really the key to winning. If you’re looking for more in-game specific strategies, check out extra tips at Left 4 Dead 411. It’s possible to do the first level of the L4D demo in 34 seconds if you do it right. First, pick Howie, which is the closest character to the edge, then simply pause on the ledge for a split second before walking off onto the garbage can. If you do it correctly, your team won’t stop you from jumping off and you’ll make it with minimal damage. Here’s my rough speed run through the first level of L4D in 34 seconds. If you’re ever looking for a command in Left 4 Dead, you can simply go into the console and type: cvarlist and it should give you a full list of commands. Even easier, you can START by writing a letter and then press the up or down arrow to scroll through the commands. Taken from Scuzball in the Steam Forums, Thanks Scuzball! This works for single and multiplayer as of now, and is of course an incomplete feature, so don’t even think about bugs or balance! This is purely for fun and curiosity! There are scraps of Versus mode inside the demo. If this post is somehow against the rules, delete it at your leisure. 1. From the starting screen, click Options, then Mouse/Keyboard, and enable the developer console. 2. Start a single player game and open your console with the ~ key. 3. Type “sv_cheats 1” This will enable cheat mode. You get to choose where to spawn as a baddie, but the AI controlled survivors will not leave their starting room and the game will not start on its own. 5. Type “director_force_versus_start 1” in your console to begin the round. The survivors will start hacking their way through the apartment building and you finally get to try your zombie character! 6. When you die (and you probably will), you will not respawn. Press space to cycle through different spectating modes till you are in in free flight mode. You must then use these commands in the console. In Multiplayer, this will only work if you are the lobby leader and you choose to host the game locally; it will NOT work on other people’s dedicated servers! Many people including me have been unable to get the AI survivors to leave the safe room in the subways. Unless someone gets a work around, this only works on the apartment level. I was iffy about my pre-order to be honest, but now that I’ve gotten 3 of my friends to try the zombies, they’re all buying the game today! Don’t scare the witch ! Second note would be does anyone know how to make the bots less f*cking stupid..All they do is wait for you like a bot…they have no will like in CSS source…..
With the brightness thing, what the hell are you trying to do?! With so much brightness, you’re killing the game’s spirit! The game is supposed to be very dark, when the only lightsource is your flashlight and other small light sources. Assuming that nothing has radically changed from the Quake engines to Half Life (and thus Source), you actually want mouse filter disabled for the most responsive play. Having mouse filter enabled makes your input delayed to make it appear smoother, but to do that, it has to read the next X inputs, THEN update on screen. Also, mouse acceleration is a personal preference – there are undoubtedly pro FPS gamers who use mouse accel very successfully (notably, Russian Q3/4 players seem very effective with it). That being said, I generally prefer no mouse accel. Nice stuff though. Thanks for the article. Okay i got this game and i serch the web, and the steam site, and i still cant find this any where so ill see if someone can help….. i install the game, and let the game update, and when it is all done i hit launch, and i get this little pop up “left4dead.exe has encountered a problem and needs to close. We are sorry for the inconvenience.”. i turned off my firewall, and my anti virus i have no idea what to do, does anyone have an idea? How can you kill a witch with a single shot? do I need a certain gun? Angle?, password? just curious…. theres only one problem, I bought L4D for XBOX 360 and i bought the messenger keyboard for $20.00 and it didn’t work (yeah, I know I’m stupid)….. . And that steam website how does it work. I bought a half life game(you know half life, right?) and it used steam and every thing and regestered and all that, but it ended up not working. So now i cant get any extra maps or anthing. all I have is the plain old game. please help……anyone. To kill the witch with one shot you have to use one of the shotguns. Just walk up right behind her and blast the whole shot into her head. If she doesn’t go down make sure to keep firing so you don’t die. To kill the Witch with a single shot, just stay right next to her (touching her, in fact), then shoot. BUT, and here´s the catch… you have to wait for her to stand up. Then you can shoot at her body, or her head (so you get the crown achievement). Another nice trick is to get her from behind. She stands and she can´t hit you. I don´t know if this was already fixed. Asus PG258Q Review - Does 240hz Make It The Best Gaming Monitor?